This section provides answers to questions that arise from adding maps to websites and blogs. Please contact us if you encounter a problem adding your map which is not answered here and we will do our best to help. How do I create the map to embed ? for full instructions on how to create a map using Google My Maps. My Maps can be created and edited at any of the national Google Maps sites, e.g. My map doesn't display ? The likeliest cause is that the URL entered is not the address of a KML file. Open your Google My Maps page, and click on the 'My Maps' tab. 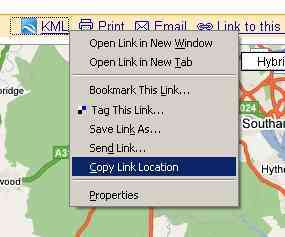 Right-click on the 'KML' link, and select 'Copy Link Location' or 'Copy Shortcut' (see below). Paste the copied URL into the textbox above (Right-click on the textbox and select 'Paste'). Note : your map must contain at least one element : a marker, line or polygon. Using Google My Maps you can add descriptions for places in plain text and then illustrate the description using some HTML. Here are a few simple HTML features to use. This code displays an image, with a tooltip and alternate text for use if the image cannot be loaded. * Although not required you should include the width and height where known in order to display the Info Window using the correct size. Enclose the <image> element inside a <div > element and use a 'float' style to wrap the text around the image. You can specify the size of an info window by enclosing the html in a <div> element. Additionally you can make the div scroll when there is more text than can fit within the info window's drawable area. Try adding this html to an info window that has a substantial amount of text or a large image. 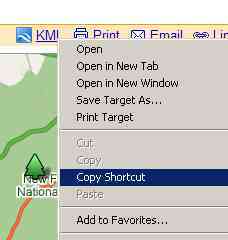 * An alternative is to select 'Concise Info Window' in the Map Script Options. This displays the place description in the sidebar instead of the info window. Note: single or double quotes are interchangeable in the examples above, just ensure that the type of quote matches. e.g. an opening double-quote must be be followed by a closing double quote, and not a single quote.